Preparation time: 10 minutes. Chilling time: 6 hours. Place water, vinegar, and salt in an airtight container; stir to combine. Add cucumber and onion slices; stir to combine. 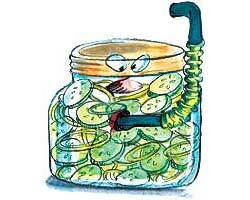 Cover tightly and chill for at least 6 hours to allow cucumber and onions to pickle. Drain off liquid before serving.